Devonshire Colic is an affliction caused by lead poisoning that affected the people of Devonshire, England throughout the 17th and 18th centuries. The infirmity was the result of the use of lead in the production of the apple cider as the press was constructed in part by lead. This discovery was made by Dr. George Baker in the 1760s and by the mid 1820s lead poisoning due to cider was nearly non existent. 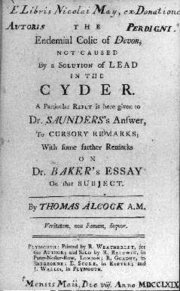 The first written account we have of the colic comes from 1655. Symptoms began with severe abdominal pains and the condition was occasionally fatal. Cider is the traditional drink of Devonians, and the connection between the colic and apple juice and cider drinking had been observed for many years. This was commonly attributed to the acidity of the beverage. William Musgrave's publication De arthritide symptomatica (2nd edn, 1715) included the first scientific description of 'Devonshire colic' - it was later referred to by John Huxham and George Baker.